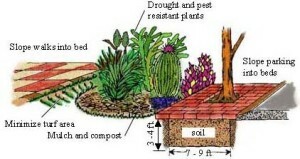 This refers to the conservation of water through creative landscaping. With water now considered an expensive and limited resource, all landscaping projects, residential or commercial, can benefit from this sustainable alternative. In order to address California’s severe drought conditions, it is important to consider the variety of ways to reduce water usage for your plants and landscaping. 2-3″ of mulch on non-turf planting areas. repair or replace defective or broken water fixtures. You may be eligible for a rebate program for implementing more drought-tolerant landscaping.